Italy has begun dismantling an ancient obelisk in preparation for its return to Ethiopia, following a 60-year dispute. 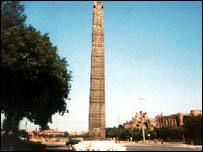 The Axum obelisk, which stands in central Rome, was named after the northern Ethiopian city from where it was looted by invading Italian troops in 1937. Over the decades Addis Abba has appealed for the return of the 24-metre high granite monument. The dismantling of the obelisk should be completed later this year ready for shipment to Ethiopia. 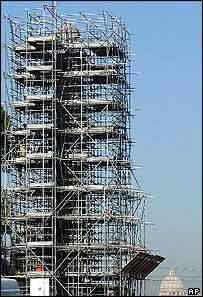 The decision to return the monument was taken in July last year at the request of Prime Minister Silvio Berlusconi. It followed an emotional appeal by Ethiopian Prime Minister Meles Zenawi during a visit to Rome. His government had said it was prepared to do anything short of going to war to get it back. The 2,000-year-old obelisk, which is carved with geometrical motifs, currently stands outside the headquarters of the UN Food and Agriculture Organisation (FAO) in Rome. There are concerns that it might disintegrate during the journey. Last year, lightening damaged the top of the monument, and a chunk of stone broke off and smashed on to the ground.